Back to the temporal archive: pork is a food central to Christian identity, a demarcative use that is positively medieval. Is it no surprise, then, that rightwingers in France — people who are fond of imagining a medieval purity of the French and of Europe that in fact never existed — have taken to serving pork-based soups to the poor in order to exclude impoverished Muslims and Jews from their charity? Craig Smith reports in the New York Times that “la soupe au cochon” has been christened “identity soup” by those who serve it (many of whom belong to the extremist Bloc Identitaire, whose website features feral pigs…. The Jews, the Christians, and the Muslims of today’s Paris are not the same as the Jews, Christians, Muslims of the Middle Ages, but that pig soup and the lines of community and exclusion it is supposed to materialize really are part of the food’s enduring medieval temporality. Spooning out dishes of pig soup won’t work, of course, to bring about the wished-for boundaries and purified spaces; it may even provoke violence (in anger over exclusion, in anger over the fact that the soup isn’t magically doing its demarcative job). This “traditional” meal of pig flesh is served with exuberance, and as if in perfect innocence (“la France n’est pas encore une république islamiste” the racists declare sweetly, ladle in hand). Yet la soupe au cochon marks a frightening return of medieval rhetorics of antisemitism and Islamophobia, demonstrating the ways in which an object as seemingly inert as bowl filled with pork can carry into the present its own little wrinkle in time. On Saturday, I saw La Vie en Rose (in France: La Môme (The Kid)). Edith Piaf has just stunned New York with a performance of the title song, full of feeling because she’s directing it to her lover, the boxer Marcel Cerdan. Marlene Dietrich shows up and declares “votre voix est comme l’âme de Paris” (your voice is like the soul of Paris: note, I swear she said ta voix, but various French bloggers contradict me). So what? The lover, the fellow who summoned up the soul of Paris in her, was Marcel “Le Bombardier marocain” Cerdan (although I should note that although Cerdan was born and lived in Morocco, his parents were born in France). 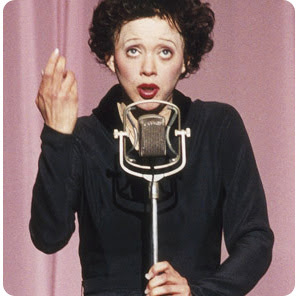 And Piaf? The Soul of Paris? Her mother was Italian, but not only Italian: Edith’s maternal grandmother was an Algerian Berber, Aïcha Saïd Ben Mohammed. This entry was posted in General Culture and tagged Bloc Identitaire, Christian identity, racism by medievalkarl. Bookmark the permalink.